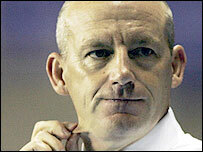 Reading boss Steve Coppell has won the Barclays manager of the month award for September after his newly promoted side enjoyed a three-game unbeaten run. The Royals collected seven points from a possible nine and are currently seventh in the league. In September, Coppell guided his side to victories over Manchester City and Sheffield United before the 1-1 draw with Manchester United. "This is a real surprise for me, I must admit," he told Radio Five Live. "It is testimony to what everyone is doing at the club. I get the prize but it is everyone else who is doing all the work I can assure you. "To win this so early in the season for a newly promoted side is a reward for all the hard work that has gone in during pre-season and the early part of this campaign. "I wish it was April or May because it would have a bit more significance. The whole club can take pride in this."